In a report released last week, Pew Research Center examined how Americans are learning about the 2016 presidential election. A new analysis of this data reveals that while Millennials overall are more likely than older generations to get political news through social media, there are striking party-line differences, particularly among Millennials who say they are very likely to take part in the primaries and caucuses. Among this group, Democrats and Democratic-leaning Millennials are far more likely than Republican and Republican-leaning Millennials to learn about the election via social media, the new analysis finds. Nearly three-quarters (74%) of Millennial Democrats who say they are very likely to participate in their state’s primary or caucus learned about the 2016 presidential election through a social networking site. This is starkly higher than the 50% of Millennial Republicans who say they are very likely to participate. These party differences were not found in other generations. In addition to social networking sites, the study asked about 10 other types of sources, including news websites and apps, cable TV news, radio and print. Republican Millennials who say they are very likely to take part in the next caucuses and primaries do not learn at higher rates from any of the 11 source types asked about. In fact, 15% did not turn to any of the source types for news and information about the election, compared with just 3% of their Democratic counterparts. In addition to social media, Democratic Millennials who say they are very likely to participate were also more likely to learn about the election from late-night comedy (47% vs. 23% of their GOP counterparts) and national newspapers in print (25% vs. 14%). The two groups are roughly equal on the remaining eight source types. 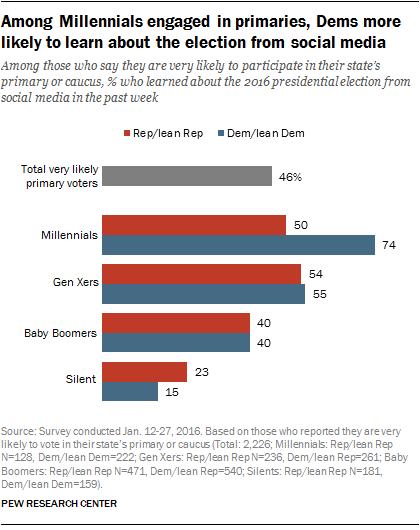 Just as Facebook is the most common social networking site for learning about the election among U.S. adults overall, it is also the most common among this subgroup of Millennials. But, again, party differences emerge for Facebook use as well as other social networks. 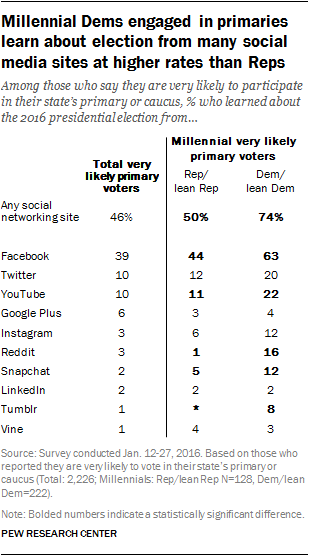 Democratic Millennials who say they are very likely primary participants turned to five of the 10 social networking sites asked about at considerably higher rates than their Republican counterparts: Facebook, YouTube, Reddit, Snapchat and Tumblr. Note: Read the full methodology used for the analysis in this post.